Young adult fiction is loaded with great authors who exploit amazing scifi concepts to express the ever important teenage targeted theme of "be yourself." Scott Westerfeld and Rodrigo Corral's spectacular Uglies trilogy may come immediately to mind, but there are many others out there. 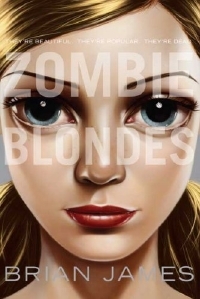 The recently released Zombie Blondes, with it's Mean Girls meets Invasion of the Body Snatchers storyline, feels primed to become another classic; but is its title appropriate? In a recent interview with SCIFI, author Brian James discusses the fact that his blonde zombies are very different from the zombies we all know and love, explaining that "These aren't the roving, rotten-flesh kind that only exist in the movies. These zombies are beautiful [and] popular... They use blood from the living to maintain their own appearance of being among the living." You know, I don't mind mixin' up the zombie mythology here and there but, uh, that's called a Vampire dude. Perhaps "Vampire Blondes" wasn't quite as catchy a title as author Brian James would have liked but lets not kid ourselves here. James has obviously exploited the Zombie metaphor to suit the "be yourself" agenda of the book without giving credence to any of the mythology and that , my friends , does not bode well with me. And hey, I even like fast zombies so there you go. I'm not that picky. A few corrections, if I may. 1. My zombies do eat flesh. 2. They use blood in a transfusion sort of way...the way I did it, it's not really like vampires. 3. If you read the book, i think you'll find there is credence paid to zombie mythos. I'm not a vampire person. They don't interest me. Zombies are far more interesting.